For one and all students of 10th and 12th class under Tripura Board, here Chekrs has brought solution for you to cope up with the stress of board class. 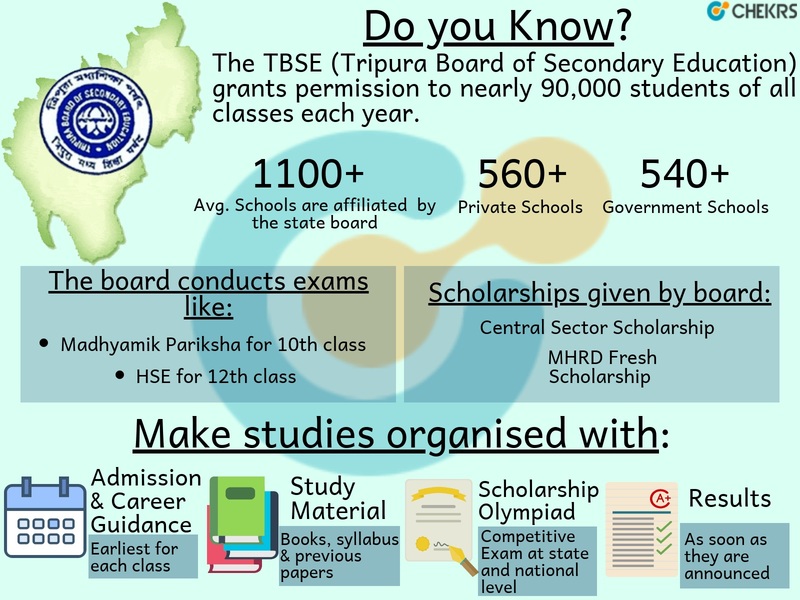 Know Your Board: The Tripura Board has been established under an ACT in 1976. The system of higher secondary i.e. +2 was introduced in 1978 and since then it has been effective. Moreover, the board also regulates Madhyamik Madrassa Education. Tripura Education is one of the boards in the country which has accepted Centralized Education system since its inception. To most students, the examination doesn’t stress out rather their preparation do. Thus here we have introduced students one of the easiest education portal from where they can get complete updates of TBSE Routine. Being here, any of regional board students can utilize information of TBSE Time Table and TBSE Syllabus to stay ahead. Moreover, we also facilitate free downloading of TBSE Books so to promote smart studies and test self efficiency to perform in exam through TBSE Test Papers which are compilation of previous papers. The scholarships and facilitated study programs are one of the best ways for all those hard working students for whom accessing education is challenging. Here at Chekrs we deliver information all those students who can avail Tripura Scholarships and have bright future. Also we give exposure on National Level Olympiads through which the students cannot just add certificates in their portfolio but also take opportunity of resourceful studies. Why Chekrs for TBSE Class 1st To 12th ? Regardless of the board a student belongs to, it is common for all to get confused for the choices later on. Here at Chekrs we share our well researched and extensive information on the degree/diplomas/subjects available after 10th and 12th. Here you are given knowledge that which broadens your perspective on your area of interest. tbse.in, Tripura Board Madhyamic/ 12th Time Table 2019 can be checked online here. Get Tripura HSC/ CHSE Date Sheet. Check TBSE Admit Card for Madhyamic/ 12th Exam. Tripura Board Results/ Scorecard 2019 for Madhyamik/ 12th Exam 2019.